Imagine winning the Super Bowl 19 years in a row. 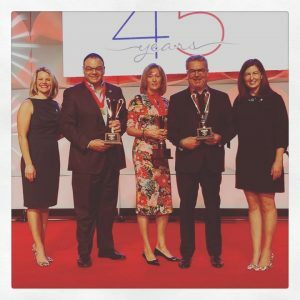 But RE/MAX Real Estate (Central) in Calgary has done just that in the real estate industry – an incredible feat – by capturing the award as the top producing single RE/MAX office in the world in 2017. Realtors with the local firm, which began operations in 1984, were involved in 5,046 transactions. The award was announced at this week’s RE/MAX international R4 Convention in Las Vegas. The Central office is owned by Patrick and Denise Hare. Serene Smith, Chief Operating Officer RE/MAX International, Nick Profeta, Denise Hare, Pat Hare and Karri Callahan, Chief Financial Officer RE/MAX International. “We’ve actually won it 20 times,” says Nick Profeta, Chief Happiness Officer, Manager and Agent with RE/MAX Real Estate (Central). “So we won it in 1997 the first time. We lost it in 1998. And we won it again in 1999 and we’ve won it every year since. The office has close to 300 realtors. “When we won it the first year you could have said it was the Calgary market or the economy or the oil industry. But for us to win it consecutively for 19 years in a row, we know we have top notch staff and agents. The city of Calgary is an incredible city and we owe credit to our clients that choose us,” says Profeta. Profeta says the real estate company also credits its success to its service providers and all the suppliers who assist it from lawyers, home inspectors, mortgage brokers, home stagers, photographers, website providers and printing companies. 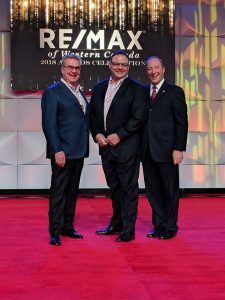 “Besides that we definitely have a good structure in Calgary, the real estate board, our association and the council as well as the RE/MAX head office and the regional RE/MAX office in Kelowna who have provided support through the years,” says Profeta.